The use of interactive kiosks with touch screens has gained tremendous popularity in many retail environments over recent years with a plethora of business owners choosing to apply the technology to a wide range of products and retail services. Developments in both hardware and software have made kiosks an attractive proposition and the shorter adoption cycle to the mass market compared to the 25 years it took ATMs and 10 years for mobile phones illustrates their success. It’s no secret that the modern consumer demands more interactive features and freedom of choice when making purchases which is why more and more retail companies are contemplating incorporating similar technologies into their daily operations. Research by Forrester even suggests that the majority of large and medium sized retailers with both brick-and-mortar establishments and online stores are considering employing interactive touch screen kiosks at their locations in the near future. Customers, many of whom are now vastly experienced in making online purchases, are said to be more comfortable using self-service kiosks than waiting in line or dealing face-to-face with instore personnel so interactive kiosks and touchscreens appear to be the next logical step as retailers try to capture any slight competitive advantage in an eminently competitive sector. Kiosks don’t need time off work and they don’t need expensive training or have excessive wage demands. Instead, they offer a cost-effective solution and are comparatively cheap too. There’s no suggestion that it’s the right decision to remove the entirety of your workforce in favour of kiosks, but there are significant financial benefits that can be reaped by installing them. Another reason kiosks can be a superior alternative to hiring staff is the accuracy and efficiency they provide. When processing transactions for example, there is always the chance that human error can creep in which can damage profitability, particularly if you own multiple retail stores. With interactive kiosks, that risk is simply eliminated. Equally, kiosks can ease the burden on staff by carrying out tasks that free up time for employees to concentrate on more important duties – improving overall efficiency and productivity. Kiosks do not demonstrate preference, bias or any other traits that could compromise the overall customer service experience. Additionally, owing to the sophisticated features they employ, kiosks can provide numerous functions in one place making shopping a smoother experience that will only encourage customers to return. Kiosks have been proven to speed up transactions in retail environments. Notably, in the UK retailers such as Argos have made great use of the technology. Whereas before staff behind the till were the only ones responsible for accepting orders, leading to long wait times for customers, the introduction of kiosks has led to wait times being reduced exponentially improving the overall buying experience. Even through our work with Concorde IT, we have witnessed first- hand how other big-name retailers like DFS have benefitted from interactive kiosk deployment. 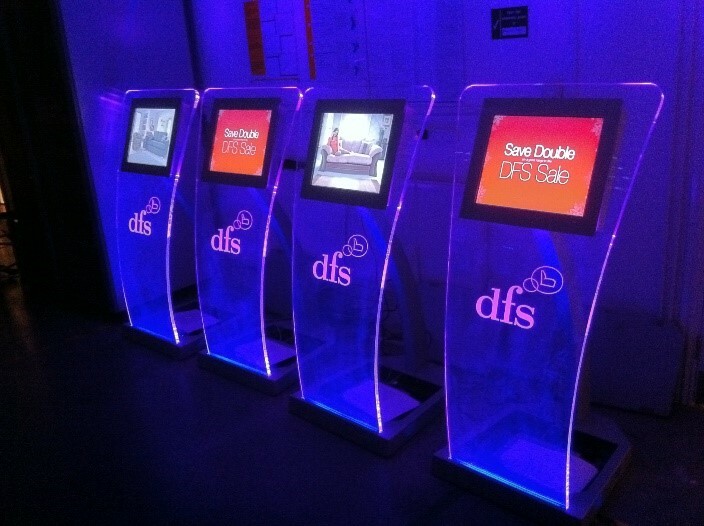 A couple of years ago we installed state of the art touchscreen kiosks in a number of DFS stores, the purpose of which was to allow customers to view the entire DFS product range via the Cammax secure browser whilst in branch, helping customers to make a quicker yet more informed choice. Kiosks can be programmed to promote specific products alongside their primary functions, making them a powerful weapon in the marketing arsenal. Touchscreens also stimulate customer’s curiosity meaning they will approach the screen simply to see what it does – combing this with advertising exposure and it’s a sure-fire way to increase sales. Thanks to the low purchase and maintenance cost of kiosks, the machines pay for themselves in no time at all and can start to healthy returns faster than any other service solution. Ignoring the sometimes sinister misconceptions, kiosks can be programmed to record data on customer’s search habits or information requests. For example, if many customers are seen to search for one particular item, your business can adjust supply/demand accordingly and review pricing. Kiosks are definitely here to stay and although we don’t advocate overthrowing your entire workforce it’s overwhelmingly clear that the advantages they offer businesses in the retail sector are abundant. In the ultra- competitive retail environment, can your business afford not to consider interactive kiosks? View our range of kiosks and get in touch with us today to find out how we can help your retail business grow.